Rinse quinoa thoroughly to remove any residual resins that might still be on the seeds. Otherwise, the quinoa can be quite bitter. Mix milk, vanilla, maple syrup and salt in a saucepan and set on simmer. Add quinoa and cook for 30 minutes, stirring frequently (but not constantly). Once thickened, remove from heat and allow to cool. Top with your choice of delicious tidbits such as berries, dried fruit, nuts, nutmeg, brown sugar, etc. By this point, you are no stranger to the brilliance that is quinoa. If you’re still learning your way around the versatility of quinoa, you can brush up on the basics with our how to cook quinoa tutorial. But if you’re already quite familiar with using quinoa in savory dishes, you are now ready to venture into uncharted quinoa territory: sweets. To begin, forget everything you thought you knew about cooking with quinoa and open yourself up to this little seed’s dessert potential. 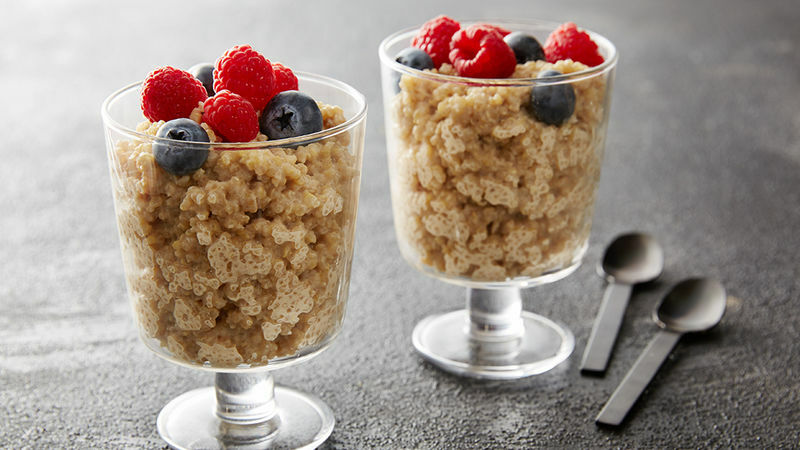 Quinoa’s ability to soak up the sweet, creamy mixture of milk, vanilla and maple syrup lends itself to a luscious quinoa pudding consistency. Try it once and you’ll be hooked for life; it’s a healthy(ish) snack or guilt-free dessert you can enjoy guilt-free.